It's GiantChess in Marble look. 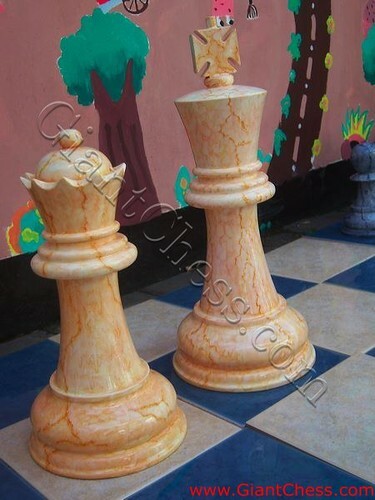 The chess pieces has made of teak wood and painted in marble texture. The marble color gives relax and cool sensation. This chess pieces are best used for decoration. It is also highly recommended for those who fancy marble furniture but want affordable price. You can decorate your living room, library, office, children room or even your patio and garden area with this kind of marble chess pieces. This wooden chess has made of Teak wood and polish in marble paint. You do not need to worry if you use your wooden marble chess at outdoor or indoor. Because Teak wood is famous as the strongest wood in the world. By this wood, your chess pieces is very durable. Beside beige color, we also have blue marble, green marble and another colors. Get this unique and beautiful chess pieces for decorate your house.